34" Training Ninja Boken Sword. Made up of Polypropylene Material. 40" Natural Wood Daito. Natural wood construction. Rubber guard. 40" overall. We at Sharp Import are always curious about your safety. While you practice swordplay, we make sure you stay secure from probable injuries. We bring the safest swords for you that are perfect for training. If you want to be a skillful swordsman, we suggest practice with our synthetic training swords. Training Swords are pretty vital when it comes to practicing swordsmanship. You would never want to use a sharp blade made of steel against your friends or peers, specially when you can achieve a similar effect by using perfectly safe practice swords. Wooden or foam blades are safest to play with. These training swords are identical to the real swords when considering the design, shape and size of the sword, but the material used for construction of the sword is what makes the difference. Want to see a few of them? 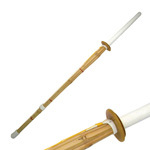 View our outstanding array of practice swords. 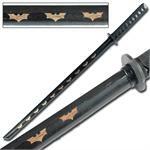 At Sharp Import, we stock a phenomenal selection of training swords inspired by the real swords. Our practice swords closely resemble the real ones and provide you a feel of operating the authentic swords. 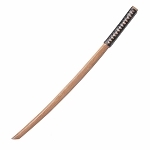 We have bamboo swords, Ninja Bokken swords, katana swords, foam swords, wooden swords, Escrima sticks and more. 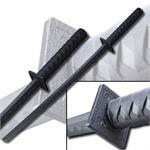 Our practice swords are typically made of wood, foam, polypropylene. You can choose whatever material you like. Wooden training swords are highly durable, but a little weighty. Foam swords are quite safe to use as there would be absolutely no chances of injury while practicing with these swords. They are lightweight and easy to control. We have swords made of polypropylene, that offer greater durability, and are ideal for practicing swordsmanship. See that huge selection to choose the best training word for you. 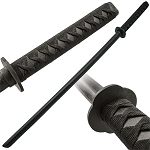 Sharp Import serves as the greatest platform for buying practice swords at wholesale prices. We guarantee cheapest rates for our training swords. We strive to enable you to practice swordplay without stretching your budget. As compared to others, we have incredibly low, 90% less, prices for our practice swords. So, get to our finest collection of training swords, buy your ideal one and begin your training journey. Don’t want wooden training swords? If you are looking for some real, authentic swords, see our exceptional variety of Swords for sale.